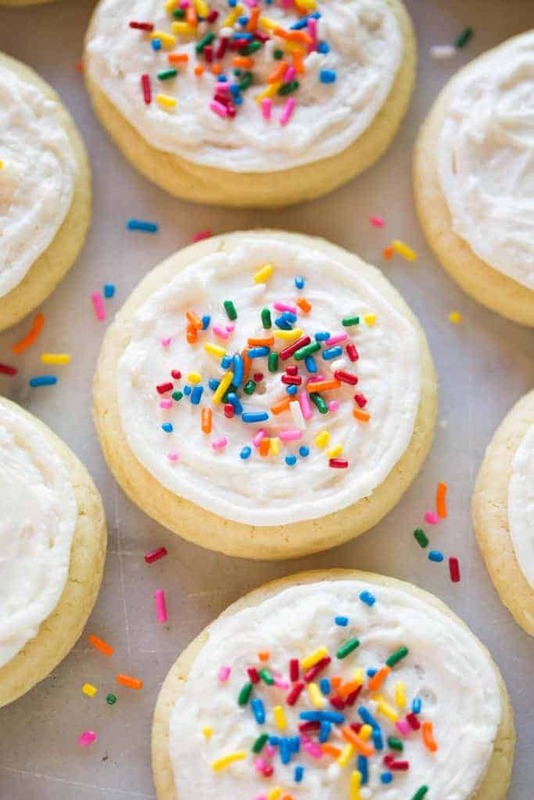 These no-fail, chewy and super soft sugar cookies are one of my favorites. Top them with cream cheese frosting or buttercream frosting. I am pretty particular about my sugar cookies. They are one of my favorites, as long as they are soft, chewy, and frosted! YUM! This version is my absolute favorite! 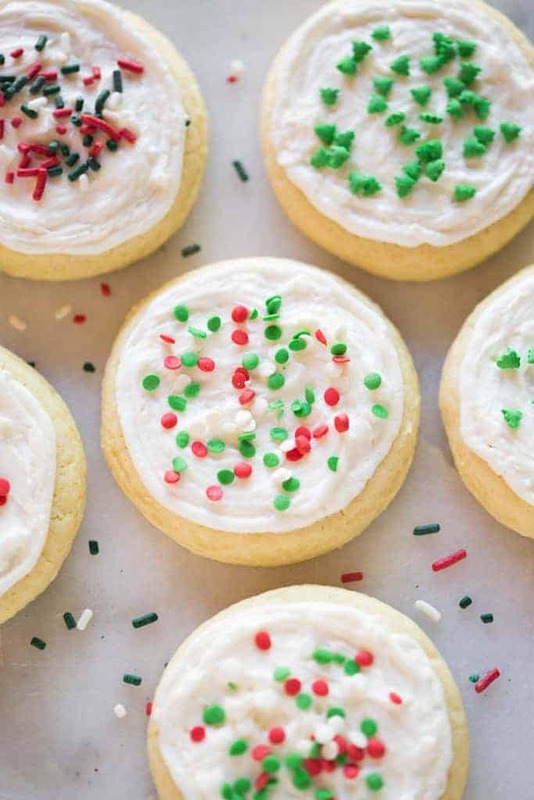 You may initially question the fact that these sugar cookies use shortening instead of butter. I’ve tested sugar cookies many different ways, and I’ve found that shortening yields a much softer, chewier cookie that doesn’t get hard. They last longer, as well, and freeze beautifully. You could substitute butter if you want, but the results will not be quite the same. Roll the cookies out thick– at least 1/2 inch. If you roll them out too thin then they are more likely to over-bake and harden as they cool. No one likes a hard, dry sugar cookie. This goes along with my first tip, but sugar cookies are different then other cookies in how pale they will appear when the timer rings. You may be tempted to cook them longer (until you see them get more golden brown), but don’t do it! The cookies will set up and harden significantly as they cool. 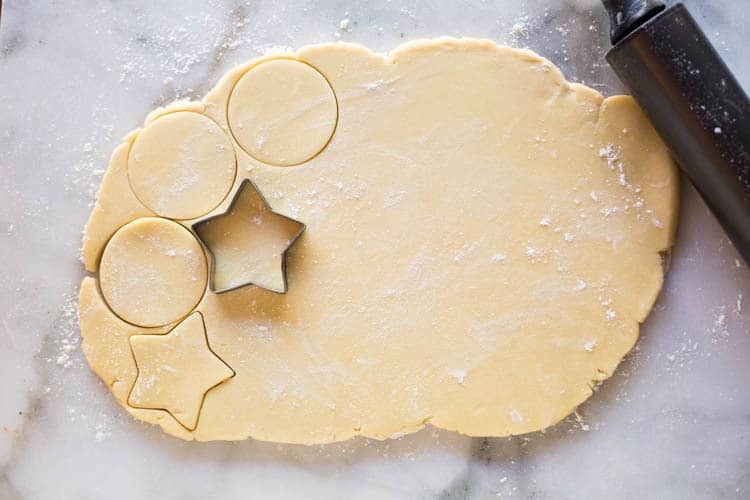 My trick for frosting perfect sugar cookies is to use a small round piping tip (or ziplock bag with a corner cut) to pipe a round circle of frosting around the outer edge of the circle. Then use a small spoon to put a dollop of frosting in the center of the cookie, and spread it out to the edge of the outlined frosting. 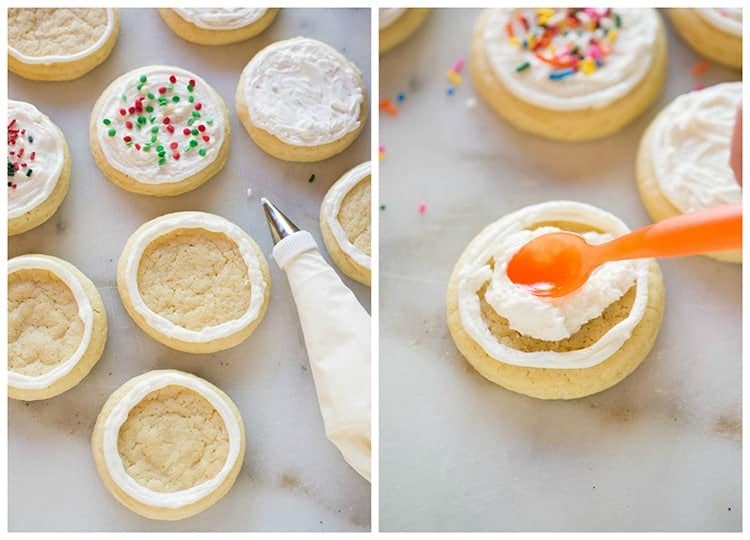 The simple step of adding the outer circle of frosting allows you to frost the cookies even faster, and they will look perfect. Add some fun colored sprinkles, if you like. Depending on the holiday there are lots of fun varieties of sprinkles you could add to make these really fun and festive. 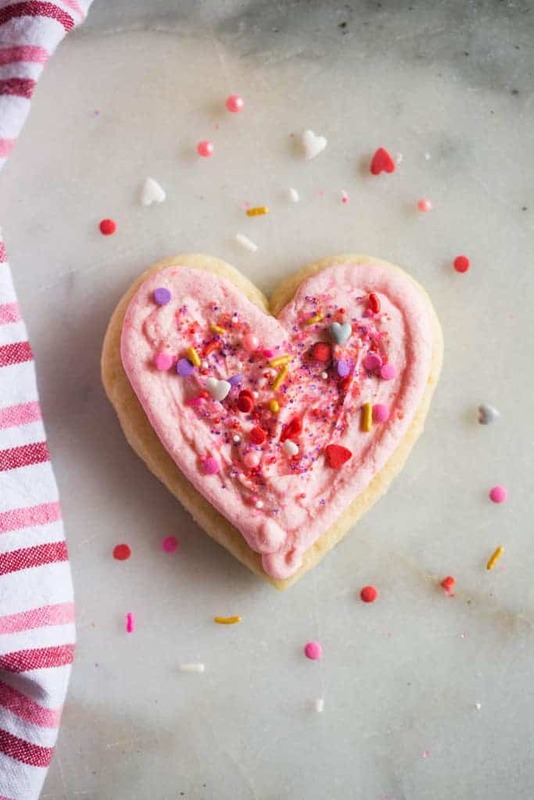 I think Valentine’s Day is my all-time favorite holiday for sugar cookies! How cute are these heart shaped ones, with pink frosting? In High school I used to make a tray of these to bring to all of my friends on Valentine’s Day. This recipe is the best for that perfect soft and chewy sugar cookie that everyone loves. I love these cookies paired with cream cheese frosting, but you could also use buttercream. I originally shared this recipe March 2013. Updated January 2018. I live at 5200′. Should I add more flour or bake at a different temp? I would just add 1-2 tablespoons extra flour, and bake the same. I made these for Valentine’s Day and they were a HUGE hit. 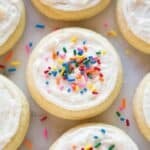 My new favorite sugar cookie recipe!